A 3/4 length men's rain parka with a fixed hood, multiple pockets, and design elements from our strong marine heritage. 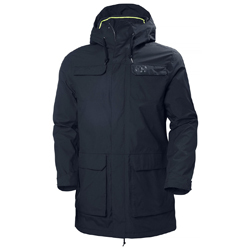 This design is a longer cut style, drawing elements from Helly Hansen's strong marine heritage into a contemporary modern fitted overcoat. Scandinavian slim tailored fit and full waterproof, breathable construction.